We set out to develop a healing herbal salve that worked better than any other on the market. With the responses we have been receiving, we have done just that. 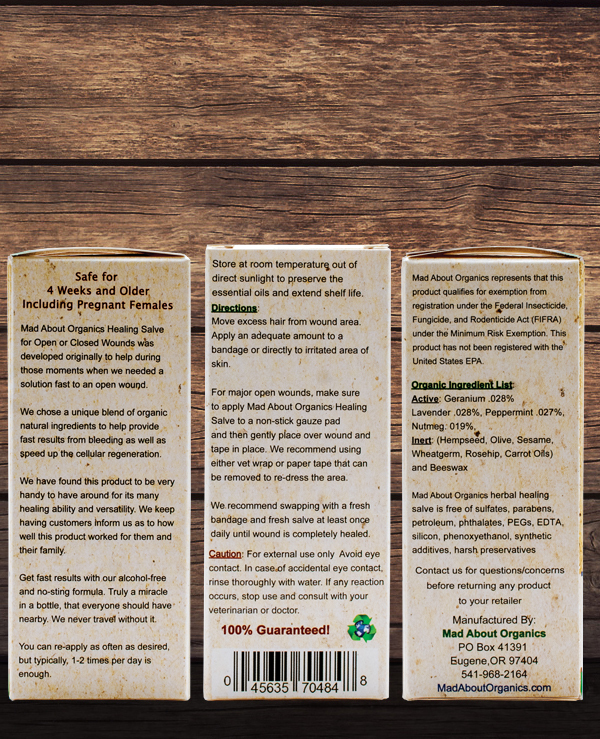 Mad About Organics' Healing Herbal Salve formula is formulated using only USDA certified organic ingredients, is not only safe and effective, but also supports environmentally friendly practices. When choosing ingredients for our Organic Healing Herbal Salve, we spent extensive hours researching every ingredient. Mad About Organics' Healing Herbal Salve is perfect for helping heal cuts, open wounds, insect bites, abrasions, hot spots, bald spots and other skin irritations. 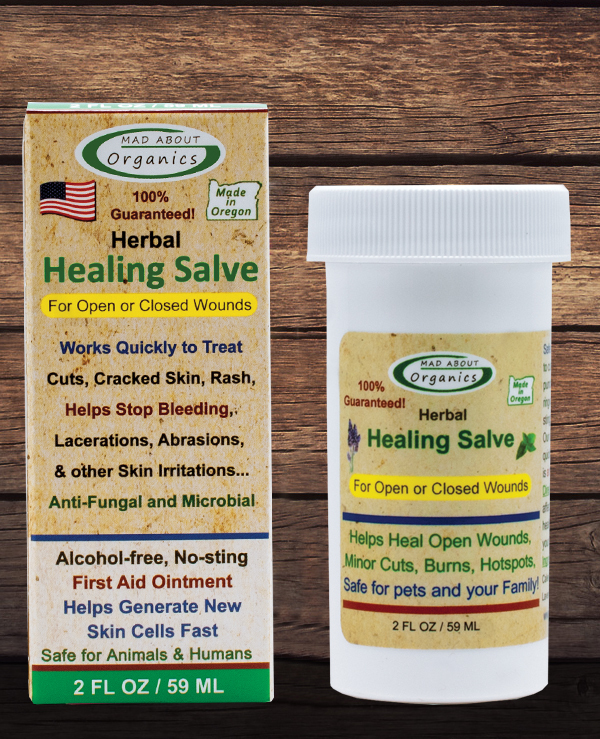 You can also use our salve on open wounds to help stop bleeding as well speed up the healing time dramatically. 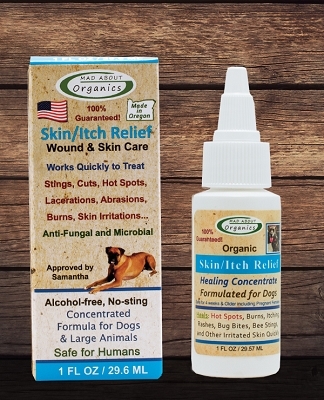 Our Organic Healing Salve goes to work immediately, so the healing process can begin. 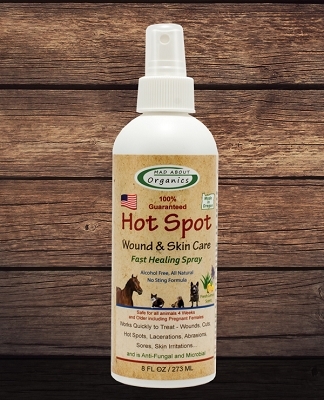 With just a small amount on the irritated area, this concentrated blend of organic essential oils relieves all of the irritations on contact. Can also be used to speed up the healing time of surgical wounds. Mad About Organics' Organic Healing Herbal Salve is made in the USA - based in Eugene, Oregon and packaged in a recyclable plastic bottle. I highly recommend this product. I constantly have cuts from work, this helps them heal faster. I also use it on my lips. It works great. So glad that I found this product! This is Amazing !!! We sell it in our store for pets but I LOVE it for myself. I'm in Vermont and my hands get very dry and crack. This salve Saves the day !! Love it !!!! This balm is unbelievable!! 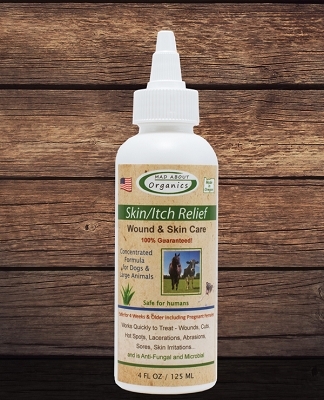 I have used on scratches and cuts and it helps it to heal SO much quicker. It smells amazing and a little goes along way. I will make sure I never run out. I have used on myself, husband and dog. Healing Salve saved my whippet puppy's pad and also sped up the healing process of a dog bite! He scraped off a chunk of his pad while running on dirt and after cleaning it up, I applied Healing Salve and wrapped it up for 12 hrs. When I changed the wrap the next day, it looked really good. Within one week, the pad grew completely back and was 100% healed. A few weeks ago he was bit by another dog and had two puncture wounds on his shoulder. I applied Healing Salve twice daily, along with warm compresses and antibiotics for a week. Huge improvement! Continued with just Healing Salve and the wounds closed up, and now hair growth is beginning. Record speed for a dog bite like this. I take Healing Salve on every outing when I know my whippets will be zooming. It's a soothing, all-encompassing, healing product and definitely my first choice! Q: Does the organic healing salve contain tea tree oil? My vet said it can be toxic, so I just want to check! A: Our Organic Healing Salve does not contain any Tea Tree oil. Tea Tree oil can be harmful to cats, which is why we never use this ingredient in any of our products that are designed for cats. As you will notice we color code our products with stripes. The products designed for cats and small animals have red stripes, dog products have blue stripes and the horse and farm animals have typically green stripes. 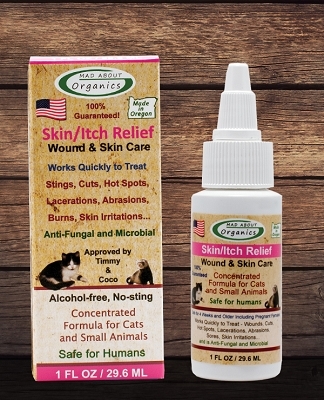 If a product is designed for both cats and dogs, it will have a red and a blue stripe on the label. Hope this helps. Q: My 3 yr. old cat has autoimmune issues affecting the paw pads. He is under veterinarian care and is given a small amount of immune suppressing drug each day. Since his paw and toe pads sometimes get cracked would the healing salve work to soften and loosen the crust on his paws? Vitamin e oil is being put on his paw pads daily and this works but it takes awhile before the crusts soften and fall off. A: Thank you for reaching out to us regarding your cats issue. Yes, our healing salve would be a great product to help with the situation you are describing. If you can, we would recommend applying some salve to a gauze pad and wrapping the foot for a day or two, this will help keep the area clean and allow the salve to heal the skin tissue and speed up the healing time. Q: Would this be safe to use on my puppy after being neutered? He’s wearing a cone and trying to lick and scratch the area. I have to believe it’s itchy. A: Yes, that is a perfect time to use our Healing Salve. It made a huge difference with all of our animals when they had surgery. It is truly that easy. And yes it is okay if your animal licks afterwards, but we usually recommend distracting and petting them for a few minutes to allow the oils to penetrate and begin the healing process. For best results, we recommend applying treatment once in the morning and again later in the day.